After asking you all what your favorite summer produce is (as part of the Saucy Mama Giveaway - see bottom of post) Brian and I had a discussion to sort out our favorites. I didn’t realize what a tough decision it would be to make! There are so many options, and I feel that my mind changes every few weeks as a new fruit or vegetable ripens into its season. We settled on tomatoes and peaches as our top two, and an entertaining debate ensued. In the end Brian’s number one was tomatoes and mine was peaches, and although the results are questionable (peaches and tomatoes are at their peak right now which brings up the issue of bias...) we each appreciated the merits of the other’s argument. I’ll spare you the tomato argument today - it will have its place in the weeks to come, I promise. Instead, lets focus on peaches. Those perfect, plump, juicy globes with all the colors of the sunset splattered across their fuzzy skin. I love them - absolutely and with all the fervor deserved after waiting ten months for their reappearance in my daily diet. 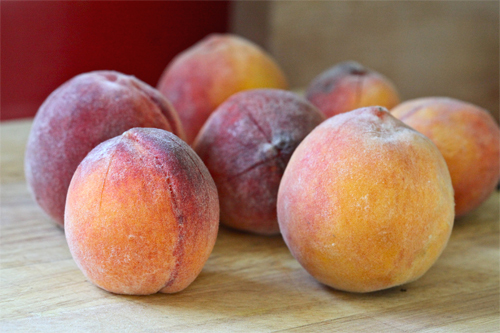 In their season, allowed to ripen on the tree and consumed within a couple of days of picking, fresh summer peaches are nothing like the bland, grainy imposters that fill bins in the supermarket during the off-season months. The peaches themselves played strongly into my final decision. Those flavorful bites - sweet with a little bit of tart - that result in juice running down your arms to your elbows are pretty hard to beat. But the clincher, that final argument that sealed peaches firmly into the number one position on my summer produce scale, was their procurement. The actual act of wandering the orchard, ducking into the dappled shade provided by row after row of trees, finding the perfect peach and picking it with my own hands. Brian and I have been to Chiles Peach Orchard three times already in the six weekends that pick-your-own peaches have been available, coming home with 25 pounds after each visit. What does one (or in this case, two) do with 75 pounds of fresh peaches? Many wonderful things, dear readers. You’ve already heard about one, the slow-rise peach pancakes that graced our table one Sunday breakfast. There have been peaches in smoothies, oatmeal and on top of cereal. They’ve been baked in the folds of buttery pastry, grilled to perfection on the grill and simmered with blackberry puree’ to form the most delicious jam. I’ve even frozen half-a-dozen quarts for future cobblers and milkshakes during the off-season. 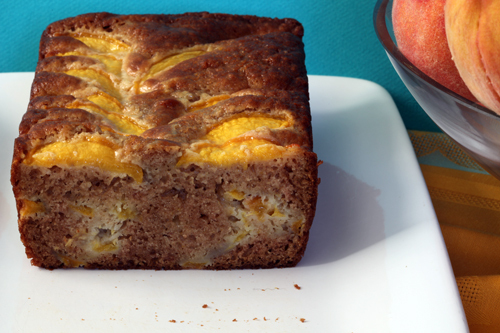 I hope to share all of these recipes with you, but for now, I leave you with my newest addiction - Peach Bread. I’ve made variations of this recipe several times in the last few weeks, tweaking a bit each time until declaring this final version my favorite. It is based loosely on a recipe of my momma’s, with a bit of influence from Molly’s banana bread in A Homemade Life and a lot of gut instinct. Dense and moist with an almost cake-like crumb, this bread has all the flavors of a classic peach cobbler. I love it icy cold, taken straight from the fridge and paired with a cup of coffee for breakfast, but it is also delicious for dessert after being warmed briefly and topped with french vanilla ice cream. Preheat oven to 350*. Spray a 9x5 loaf pan with cooking spray. Cream the butter . Gradually add sugar and mix to combine well. Add eggs, one at a time, beating well after each addition. Stir in yogurt and diced peaches. Combine flour, salt, baking soda, nutmeg, and cinnamon together in medium bowl. Add ginger, if using. Add the wet mixture to the dry, stirring until just blended. Spoon batter into prepared loaf pan. 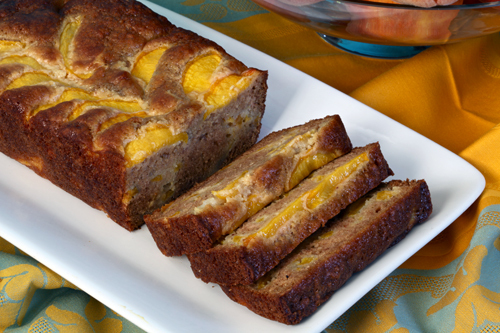 Place peach slices across top of batter, in decorative pattern. Bake at 350* for 45-50 minutes, until a toothpick inserted into the center comes out clean. Cool in pan for 10 minutes on wire rack. Remove loaf from pan and let cool completely before slicing. Congrats to Shelby of La Belle Vegan and Rose of On A Lobster Placemat for being the winning commenters picked by Random.org! Send me an email at bellaeats@gmail.com with your full name and address so that I can get your Lime Chipotle Marinade out to you. Congrats ladies!